Banpo Hangang Park is siuated on the Han River in Seoul, the great metropolis which is both the capital of and the and largest city in South Korea. AirVuz contributor Roam with John created an amazing video by flying his drone over this park during the day and also at night. You'll get a splendid view of the park as well as the gleaming skyline of Seoul. Having been thrust on the world stage as host of the 1988 Summer Olympics, Seoul is now the center of one of the world's largest metropolitan areas. Description: Hey guys, it's been a while since I uploaded a video from Korea. Now that I am back here, gonna be giving you all lots more! 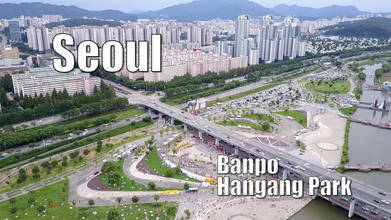 First off, is around the Banpo Hangang Park. This area is pretty popular among the millennials who love to walk along the Han River and also watch the Banpo Bridge light up at night.